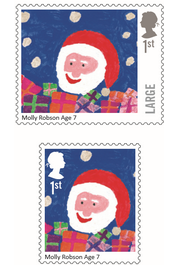 Christmas Stamps will include children's designs again. 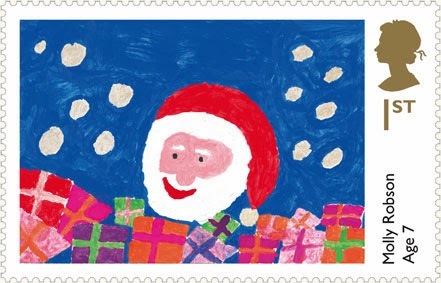 The Children's Christmas Stamp Design Competition is back - it doesn't seem four years since the last one, but this year's Christmas stamps will include winning designs by primary school children. The competition theme is "What does Christmas mean to you?" and as before schools are being encouraged to participate with prizes for the winning designer and school, and regional winners. The competition closes on 17 March, with winners announced in late July, and the stamps going on sale in November. 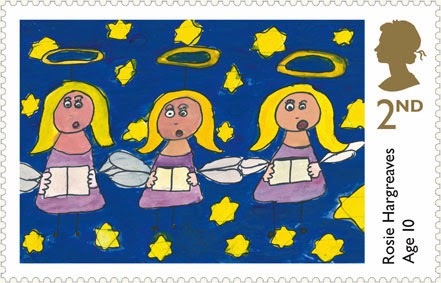 It's not clear whether the stamps will be additions, as in 2013 when the Father Christmas and surprised-looking Angels stamps were issued in separate booklets, or whether these will form part of the main issue - or something else. Two lucky winners will see their designs made into one of the 1st or 2nd Class Christmas stamps for 2017.
there will be two different Christmas stamp sizes produced in 2017: a large and a small size as shown opposite. It is therefore important that the design can work for both sizes. 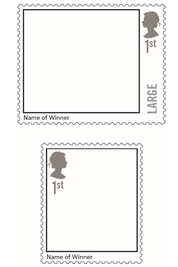 To illustrate this Royal Mail demonstrate how one of the 2013 designs would look as a definitive sized and Large Letter sized stamps. With this year's stamps having religious designs, these are likely to be additions, but in both normal and large letter designs. Entries are not limited to children at conventional schools and home-schooled children may also enter. Full details and very lengthy terms and conditions can be found here. It does seem a pity to limit the designs to under 12's. Older children with a real interest in art and design in their further education can produce better designs which show more skill. The design by Stephen Moore used in 1981 for the 22p stamp is probably one of the best Christmas stamps we've had! Perhaps they think that designs by today's teenagers would be too anarchic? I presume that the cost of getting children to design stamps is considerably less than paying a professional designer's fees. Is 2017 not a year for religious designs? Yes, as was 2013 when the last competition was held.